Name-Comm: His common name was The Old Squire. At the Middle South River, on Monday morning the 17th inst., the oldest inhabitant of St. Andrew’s parish passed away in the person of Dougald Cameron Esq. 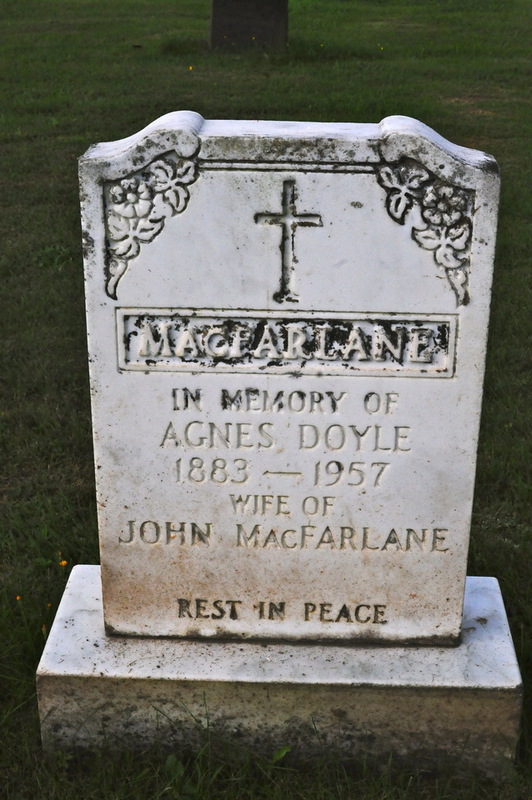 The deceased was the last surviving son of the late Hugh and Margaret Cameron, and first cousin of his Lordship Bishop Cameron of Antigonish. He was born on August 30th 1802. Of a family of thirteen, seven sons and six daughters, only one survives him , Ann, wife of John Gillis, William’s Point. The good “old squire” was a living link connecting the first native and long past generation with the living present. He was, if not the first, one of the very first Catholics appointed to the bench of magistrates in this County and held that office for 61 years. For many years past, the deceased had been disabled through rheumatism, and some time ago had become totally blind. Birth*: Ann was born after 1801 in Nova Scotia, Canada. Married Name: As of circa 1825,her married name was Cameron. 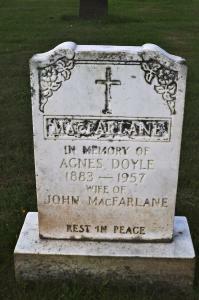 Death*: Catherine died in July 1907. [S709] Diocese of Antigonish, Nova Scotia, Canada , Marriage record of Donald McDonald & Catherine Cameron, page 493. Death*: Donald died on 28 April 1902 at age 65. [S110] Vital Statistics, transcription, beginning in 1836 St. Andrews Church. [S374] April 23-25, 1901 Canada Federal Census, 101 Newbury Street, Boston, Suffolk, Massachusetts, USA. [S879] 1921 Canada Census, McFarlane # 0637. [S709] Diocese of Antigonish, Nova Scotia, Canada , Baptismal record of John Cameron MacFarlane, page 2. Birth*: Jeremiah was born circa 1940. Death*: Jeremiah died on 2 February 1995.